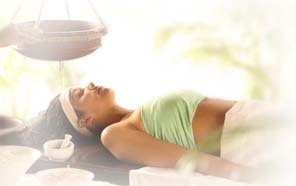 Ayurveda emphasizes preventative and healing therapies along with various methods of purification and rejuvenation. Ayurveda is more than a mere healing system; it is a science and art of appropriate living which helps to achieve longevity. It can also guide every individual in the prevention of disease and long term maintenance of health. To achieve this balanced state of body, mind and consciousness, Ayurveda prescribes Pancha karma Therapy for the cleansing of body toxins. Pancha Karma is the cornerstone to Ayurvedic management of disease. Pancha Karma is the process which gets to the root cause of the problem and corrects the essential balance of 'Tridosha' in body. Pancha Karma is not only good for alleviating disease but is also a useful tool in maintaining excellent health. Ayurveda advises undergoing Pancha Karma at the seasonal changes to clean the body, improve the digestion and to improve the metabolic processes. According to Ayurveda, every human being is a unique phenomenon of cosmic consciousness. The three Dosha (humors) determine every individual�s psychosomatic temperament or constitution. The internal environment is governed by Vata -Pitta -Kapha (V-P-K), which is constantly reacting to the external environment. The wrong diet, habits, lifestyle, incompatible food combinations (e.g. milk and fish, melons and grain, yogurt and meat or cooked honey etc. ), seasonal changes, repressed emotions and stress factors can all act either together or separately to change the balance of V-P-K. According to the nature of the cause, Vata, Pitta or Kapha undergo aggravation or derangement that produces Ama (toxins). To stop the further production of Ama, Ayurvedic literature suggests placing the patient on a proper diet together with an appropriate lifestyle, habits and exercise, and administering a proper cleansing program such as Panchakarma. As the name suggests, Pancha in Sanskrit stands for five and Karma is the therapeutic measures, therefore Panchakarma means five types of therapeutic measures. These are undertaken for the purification of the body and Ayurveda considers it necessary before the start of any other therapy. The logic being that as a cloth needs to be purified or cleaned of impurities and dust before it can be permeated with a new color; similarly the body needs to be purified before it can be permeated with new colors of youthfulness, health and vigor etc. In fact, most of the time, Panchakarma is an end in itself rather than a prelude to other therapeutic measures. This includes Sansarjan Krama (Specific dietetics) and life style modification. Shirodhara: It is recommended in anxiety, depression, hypertension, insomnia etc. Tarpanam: Useful in the ailments of the eyes. Shirobasti: Useful in hair loss and the falling hair and other diseases of skull. Marma therapy is one of the great tools of Ayurvedic and Yogic healing. Marmas are special points of energies in the body similar to acupuncture points. These are also locations in which the Tridosha Vata, Pitta and Kapha can be held, along with their subtle essences of Prana, Tejas and Ojas. As sensitive zones, marmas can hold various emotions like fear (Vata), anger (Pitta) or attachment (Kapha), as well as the gunas or primary qualities sattva (calm), rajas (aggression) and tamas (inertia). By manipulating them we can direct our Prana or vital energy for health, well-being and personal transformation. Marmas are connected to the charkas and nadis of Yoga and can be used for balancing both body and mind. In this regard the concept of marmas goes beyond modern medicine. The literal meaning of the word Yoga in Sanskrit is Integration. In this sense Yoga represents a process through which one can learn to live in the most integrated way. It involves therefore the process of identification and then elimination of all that would contribute in disintegration. In this integrated way of living, the process of identification of all the elements causing illness and the use of appropriate techniques to neutralize their ill effects became one of the primary concerns of Yoga. Thus Yoga which essentially is a Science of personal growth for spiritual experiences has simultaneously become a Science of Health and Healing. Yoga is about the union of a person's own consciousness and the universal consciousness. Ancient Yogis had a belief that in order for man to be in harmony with himself and his environment, he has to integrate the body, the mind, and the spirit. For these three to be integrated, emotion, action, and intelligence must be in balance. The Yogis formulated a way to achieve and maintain this balance and it is done through Asana (exercise), Pranayam (breathing), and Dhyan (meditation)-the three main Yoga structures. In Yoga, the body is treated with care and respect for it is the primary instrument in man's work and growth. Yoga exercise improves circulation, stimulate the abdominal organs, and put pressure on the glandular system of the body, which can generally result to better health. Breathing techniques were developed based on the concept that breath is the source of life. In Yoga, students gain breathing control as they slowly increase their breathing. By focusing on their breathing, they prepare their minds for the next step - Meditation. There is a general misconception that in Meditation, your mind has to go blank. It doesn't have to be so. In Meditation, students bring the activities of the mind into focus resulting in a quiet mind. By designing physical poses and breathing techniques that develop awareness of our body, Yoga helps us focus and relieves us from our everyday stress. You may ask, "Is Yoga for me?" Definitely, yes! Yoga is for anyone who is willing to learn its ways and techniques. What it requires is your will to have a healthier, peaceful and stress free	life.